The proposal for eastern water front development needs re-consideration especially harbor line is also going though tremendous transformation and needs to wait for reality that shall surface, few years down the line, after actual transformation of redeveloped harbor line. It is very often seen that such opportunity are not seen as an asset rather as an scenarios to activate the economic upsurge in construction industries. 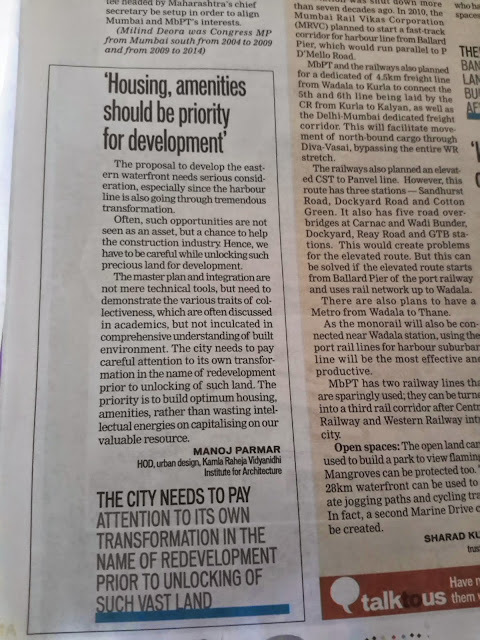 It is unfortunate that various consultant and planners eagerly waiting for an opportunity in the name of better environment, amenities, open space. We have to be careful in unlocking such precious land for the development especially when there are certain economic & social dependencies shall be conveniently gentrified along with a the global priority that developers along with various stake holders desirous to exercise, that cannot be overlooked. The scenario shall not be different from development of mill land, MHADA layouts or land unlocked in central northern suburbs. The master plan and integration are not mere technical tools but needs to demonstrate the various traits of collectiveness, which are often discussed in academics and not inculcated in comprehensive understanding of built environment. The city needs careful attention to its own voluptuous transformation in inner city, suburbs and extended suburbs in the name of redevelopment, prior to such unlocking of land. The priority is to build optimum housing, amenities to our existing conditions, better living standards, rather than waste intellectual energies on undue capitalization on our valuable resource. The exit from NH8 towards the Daman revealed sudden change of landscape. As it passes through the well maintained winding road, penetrating the thick forest almost appeared to be unending perceptually. The exist also showed the change of habitat and dialect. The terrain almost overwhelmed the greedy existence of fast movement. The Daman region arrival is archetype of any conventional city, yet sudden widen road and manicured landscape gave the feel of exclusive administrative terrain. The Moti Daman is an administrative town of the entire Daman region. The exclusiveness is further enhanced with mummification of several artifacts, including buildings. The entire town appeared to be a well thought mechano, where each piece is precisely made to fit in to its position. The bridge that connects Moti Daman to Nani Daman is scenic from its location point of view. One can view arrabian sea on one side, two cities split up with Daman Ganga River, reaching out deep into the land. The Nani Daman is in sharp contrast to Moti Daman. The tight, ordered and over-structured fabric gave way to Laissez-faire growth, not only in economic terms, but also in terms of its nature of built environment fabric, its confused aspiration to be a tourist town. The physical order of nature and self regulating system are at sharp contrast as it can get. The two towns are also connected by another bridge, not far from the earlier one. The earlier one seems to be for economic reason, while the second bridge is outskirt of both the cities, purely built for connectivity and mobility reason. The both the bridge serves its purpose for what they were planned, but the informal character and its public affair brings about new informal system, realm, public space between two cities. 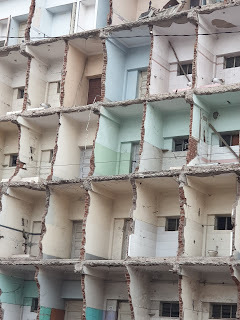 The "in between" condition that perhaps bring about the true nature of urbanism that we constantly try to understand or comprehend in academics. The "in between" conditions is an analogy of various sub-system that are being overlaid by existential order within our everyday life.